Synthetic peptide corresponding to Human Flotillin 2/ESA aa 365-428 (C terminal). Our Abpromise guarantee covers the use of ab96507 in the following tested applications. IHC-P 1/100 - 1/250. Antigen retrieval is not essential but may optimise staining. Immunohistochemical analysis of paraffin-embedded Lung CA, using ab96507 at 1:100 dilution. Antigen Retrieval: Trilogy™ (EDTA based, pH 8.0) buffer, 15min. Immunofluorescence analysis of paraformaldehyde-fixed HeLa S3 cells, using ab96507 at 1:100 dilution. Image 2: Merged with DNA probe. 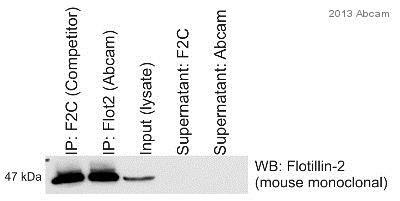 Flotillin 2/ESA immunoprecipitation from Human HeLa whole cell lysate using ab96507. 750 µg of cell lysate was incubated with primary antibody (1/500) and matrix (Protein A) and incubated for 16 hours at 4°C. my group is working on the flotillin family of proteins. I have just gone through the antibodies that you offer for these proteins and found two interesting polyclonal ones. These antibodies have been tested for several applications. However, we would like to test these antibodies in immunoprecipitation, which is so far not included in your list. Would the testing discount option be available for this purpose? These antibodies appear to be multipurpose ones, so that I am sure that many customers would be even more interested to buy them if IP was included. Furthermore, I think that we would pretty fast be able to add a reference publication for these Abs. I am very pleased to hear you would like to test both ab41927 and ab96507 in immunoprecipitation. This code will give you 1 free primary antibody before the expiration date. To redeem this offer, please submit an Abreview for immunoprecipitation and include this code in the “Additional Comments” section so we know the Abreview is for this promotion. Please remember that submission of the Abreview is sufficient for the discount code to become active.